Cote Saint-Luc resident and business owner, Marissa Sidel will be launching the neighbourhood’s first sit-down, storefront coffeehouse, Café de l’avenue, on Wednesday, August 16. “I’ve lived here my whole life and I can’t remember a time in which people weren’t asking for a proper, sit-down, storefront café. We saw the opportunity to partner with the Quartier Cavendish and we jumped at it,” Sidel said. Sidel, who has run her company, National Dispatch Services, out of CSL for nearly five years, enlisted her family and friends to get the café started. Café de l’avenue is in the Quartier Cavendish, with an outside door and terrace on The Avenue just off Cavendish Blvd. The coffeehouse will feature free WIFI for customers, power stations throughout the seating area, and will have a real neighbourhood feel. “We’ve partnered with great kosher suppliers like Elna Bistro and Mimimelon for all of our food and desserts, and our beans come from Union Coffee – legendary among Montreal coffee drinkers,” Sidel explained. Ronen Basal grew up in Côte St. Luc. He has always called it home and now he is playing a key role in developing the city as director of BSR Group – an NDG-based company located at 6138 Côte St. Luc Rd., just east of Beaconsfield Ave.
Six years ago, BSR Group went from buying real estate throughout Montreal to constructing apartment complexes and homes across the island. When property prices started shooting up, construction began. The new neighbourhood along the Park Place, Jubilee Rd. and The Avenue next door to Quartier Cavendish has changed the face of the city with million-dollar homes cropping up. A large, 90-unit apartment building is currently under construction there as well. Parkhaven Courtyard is a similar story, located at the corner of Kildare Rd. and Parkhaven Ave. where the developer has built 50 townhouses with three to four bedrooms each. These projects are just the tip of the iceberg as the company has developments in NDG, Hampstead and across the island. The 90-unit apartment building on The Avenue, directly across from the Quartier Cavendish, will include an indoor pool, Shabbat elevator, 24-hour security guard, appliances, ground floor commercial and more. It will be an upper-scale apartment complex, he said, that will likely attract many older people looking to downsize from their single-family homes. This is a demographic, he explained, that no longer wants all the hassle that comes with property ownership. They are looking for something more temporary. With senior homes closing in the area, this apartment complex could be an alternative for some, he said. While it may not have assisted living, it is in close proximity to all the services found at the mall next door, he noted. Residents won’t need a car, he said, as they get all they need in the area. Parkhaven Courtyard will be getting a 150-unit building and construction on that will begin in April. That facility, noted Basal, won’t have a pool because it is next door to the Aquatic Community Centre. The high-end apartments will have large family rooms, 24- hour surveillance, a Shabbat elevator and more. “We just finished a few projects on Côte St. Luc Rd.,” he added, including one right in front of the Côte St. Luc Shopping Centre. Another with 59 rental units is going up where Bernie’s Auto used to be at the corner of Montclair Ave. In fact, BSR Group’s headquarters is located in a building that it developed after the previous structure burned several years ago. Basal admits that the company heads and city politicians don’t always agree, but there is a willingness to discuss issues and find compromises. Many people are anxious to see the new Shell gas station, complete with a car wash and Bonisoir convenience store, open for business at the corner of Cavendish Boulevard and Mackle Road. It seems like a very long time since the Esso self-serve shut down. It took many months for digging and decontamination to take place and then came the construction for the new facility. The facility as it looks now. To the naked eye, it looks as if the facility is ready to open. But not so. First they require Hydro-Québec to install underground electrical conduits crossing Cavendish at the intersection of Mackle to supply the proper voltage of power. This will result in some short term pain, for long term gain. Beginning April 18, the Cavendish and Mackle intersection will be closed completely for at least 10 working days in order to complete the work. Our Urban Development and Public Affairs teams will advise all residents in the immediate area of alternative routes. This will include automated phone calls to residents affected, signage and information disseminated via social media. The goal will be to give motorists a heads-up on day one so they can give themselves more time. By day two, we hope people can adapt — regardless of whether they heard the phone call or saw any of the signs in advance. We all wish this could have been avoided, but in order to speed up the start of this new facility we need to respond to their request. Police station 9, serving Côte St. Luc, Hampstead and Montreal West, is urging residents to be vigilant in light of recent criminal activity. Between Feb. 1 and Feb. 5, three incidents of thefts or attempted thefts within cars took place in Côte St. Luc. On Feb. 1, a motorist parked his car at the Côte St. Luc Shopping Centre. Upon returning 15 minutes later, $5 was missing from a cupholder. There was no forced entry. On Feb. 3, a motorist visited friends on Baily Road and returned to discover the passenger side of the car had been searched and left in disarray. On Feb. 5, the front driver’s side tire was stolen from a car parked at the motorist’s residence. The police are recommending that car doors be locked at all times, that cars be parked in a lit area, valuables are left out of sight, or if they have to be in the car, placed in a trunk before reaching the destination. 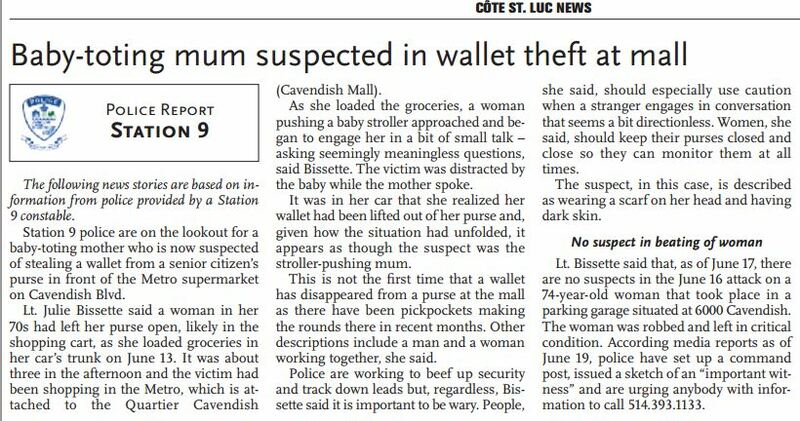 On Feb. 3 at Quartier Cavendish, a purse placed on a chair next to its owner was stolen. Police saw two suspects in surveillance videos, one of whom appeared to put an object in a backpack. 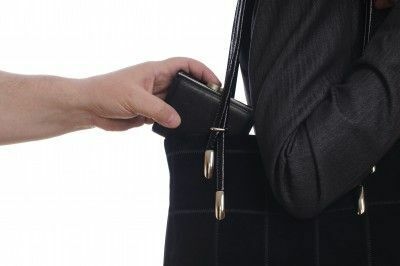 In this instance, police are recommending that purses not be placed on the back of seats, or on an empty neighbouring seat, but instead on one’s lap, and valuables be kept in a coat pocket. This article erroneously refers to the Metro grocery store at the Cavendish Mall. Obviously the grocery store there is the IGA.